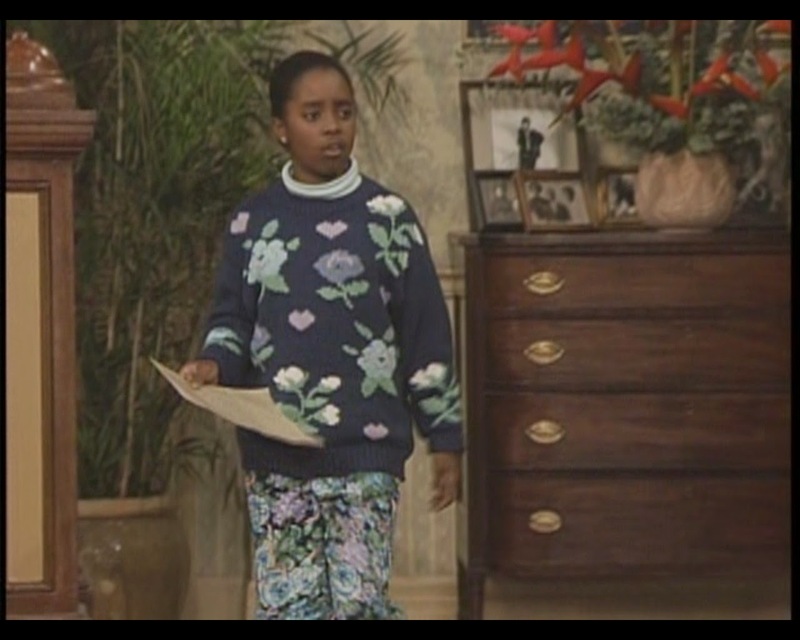 The show rarely comments on just how difficult it must be to raise five children while working a high-pressure job. Parenthood is typically a joke concern rather than a true challenge. This week changes that trend, with Clair coming home exhausted only to be bombarded with the petty concerns of her offspring, including two who have already moved out of the house and a third who should have by now. To make it up to her, Cliff ships her off to a cabin in the woods so that she can have some peace and quiet. Unfortunately, she ends up going to some crappy slum without heat or decent repair services. Somehow, this convinces her to forget being tired and just help her kids out, even though she should technically be even more exhausted now that her entire vacation has consisted of extended travel and sleepless nights. 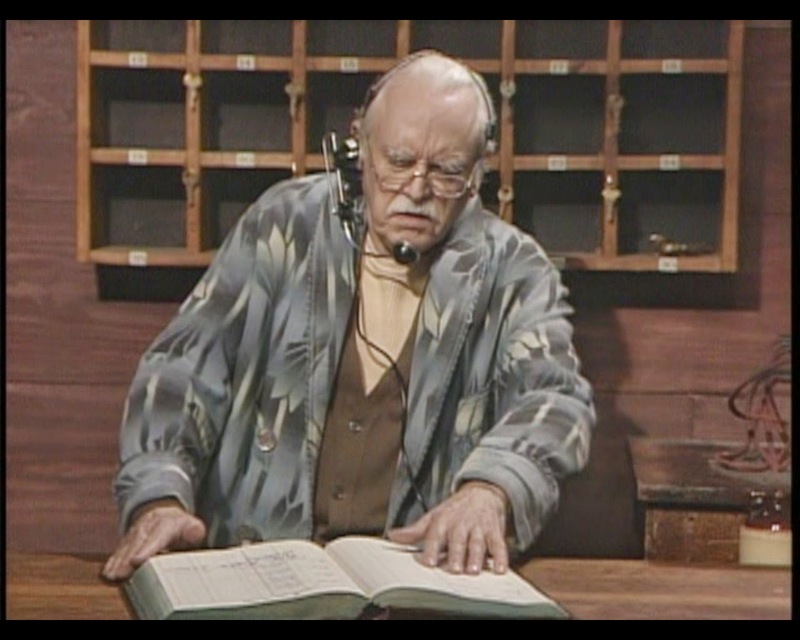 Edmund Lyndeck appears as the cabin's gloriously unhelpful proprietor. 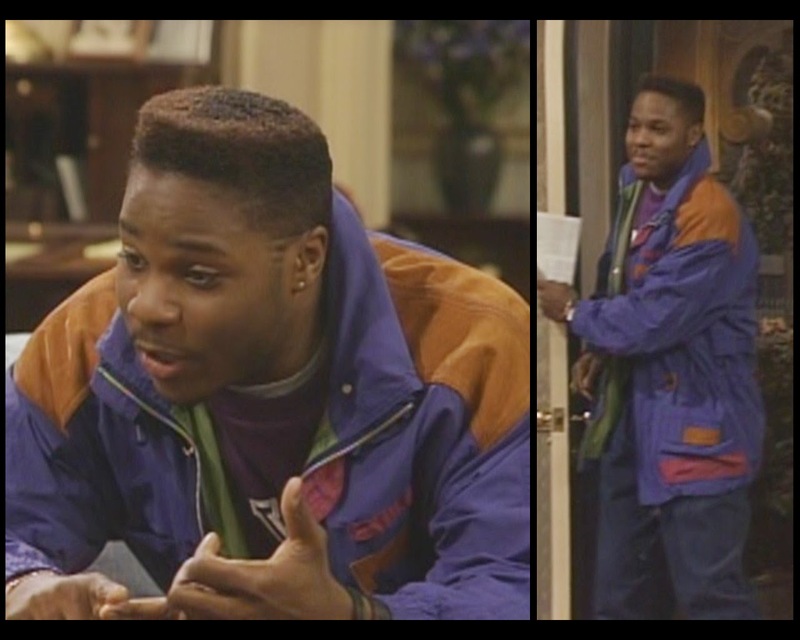 His jacket is an affront. Yes, I know that Wilford Brimley is the diabetes guy and not this dude. I had hoped for better from you. 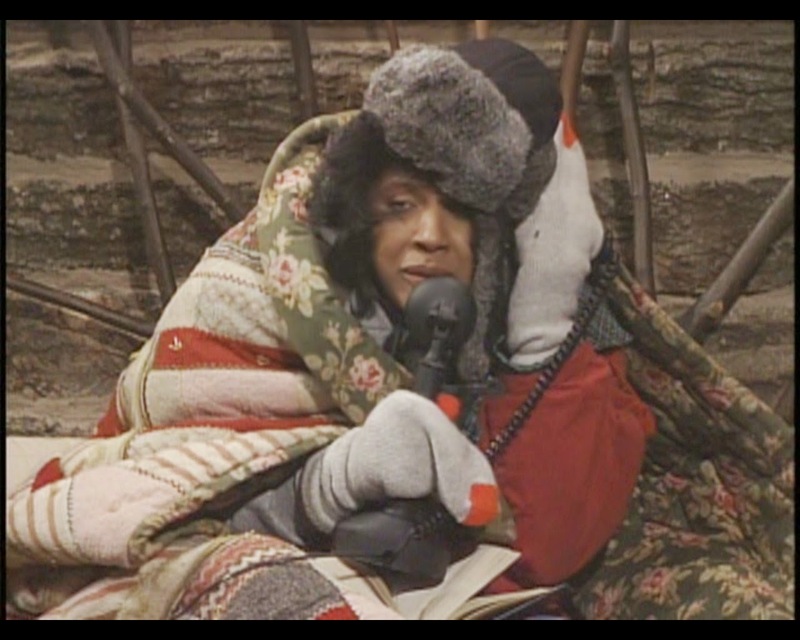 The script specifies that Olivia is in her bedclothes during her scene, so I'm skipping straight to Rudy. She has a lot of problems with her skirt. First off, it's way too high. 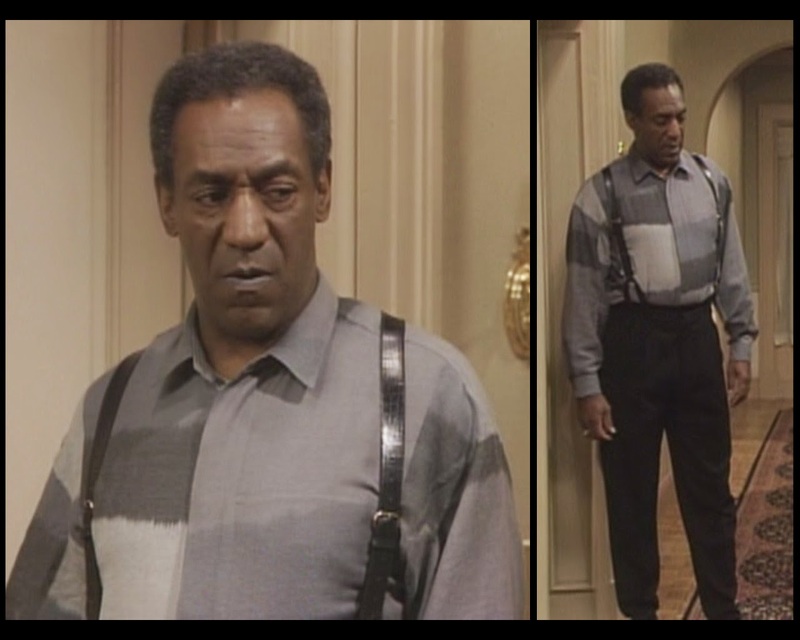 Second, it's being kept in place by both a belt and suspenders, which is insane. Third, it appears to be unbuttoned in the front. If she rectified those issues, she might have a solid thing going here. I'd ditch the multicolored straps, which are out of place in this otherwise sedate creation. The embroidery on her shirt is a better means of subtly adding color and interest. Please study your mother and sisters more closely. Did you know that there's such a thing as too much floral print? When Vanessa wore this dress in episode #5.11, it was darker and had metallic points on the collar. It's still clearly the same garment, as shown by the other markings, but it's been through the wash and probably bleached. I'm not entirely sold on the "Old West" reference point as a whole, even though she executes it well. The fringed vest and boots complete the image, while the leggings bring it into modern Brooklyn, but it's still like hearing a good singer perform a song I hate: technically accurate but unsatisfying nonetheless. Get rid of that red tint, Sinbad. How often do college students actually walk around wearing sweatshirts from their college? I never did this when I was in school. Theo is forever trying to convince us that he actually goes to NYU. I buy it. I mean, he's clearly not going to FIT. 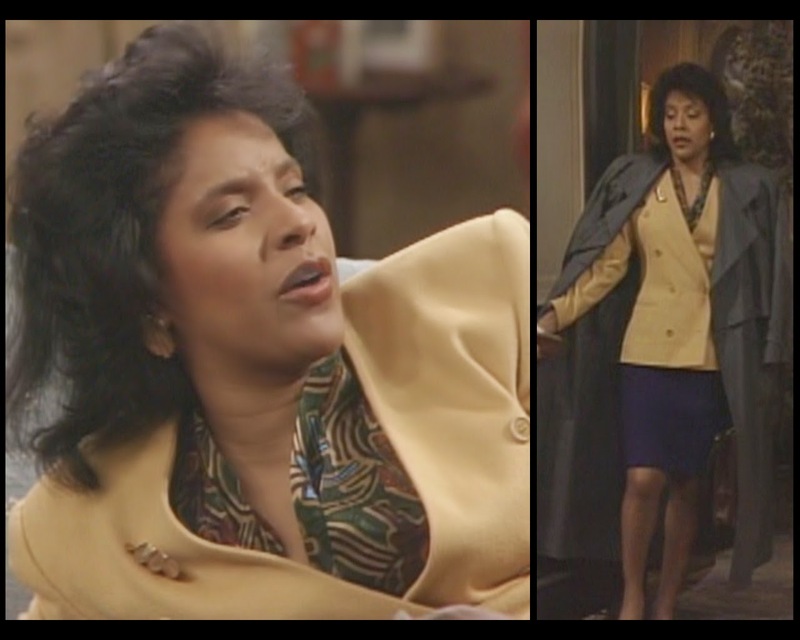 Denise's vintage hair today is everything. It's going to have to be, because the rest of her look is a little slack. The roominess doesn't work for her as well as it has with previous efforts because the fabric is too stiff: she looks tenty rather than flowy. Nothing can go well 100% of the time, I suppose. Do. Not. Sass. This. Woman. Clair's color-on-color work for her suits is always significant, and this is no exception. That deep aubergine skirt fits her ideally, and the jacket is only slightly too shoulder-y. But the way the shades play against each other? Sublime. 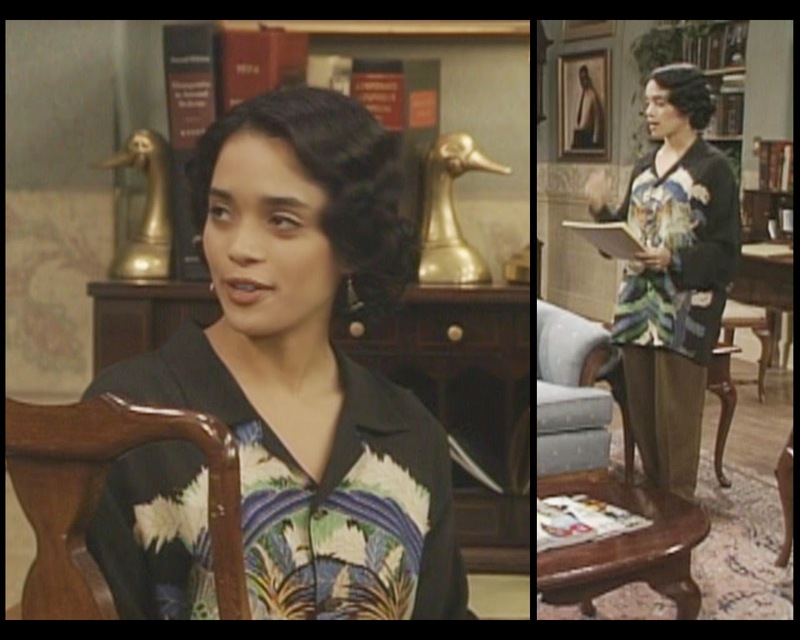 And she doesn't shy from further pizzazz, either, working a richly patterned blouse that integrates the dark purple and pale yellow while boldly introducing greens, oranges, and blues. By flashing just a hint of print at the collar, she ensures that she is teasing these hues without abusing them. She might look harried now, but she was in her right mind when she got dressed this morning. 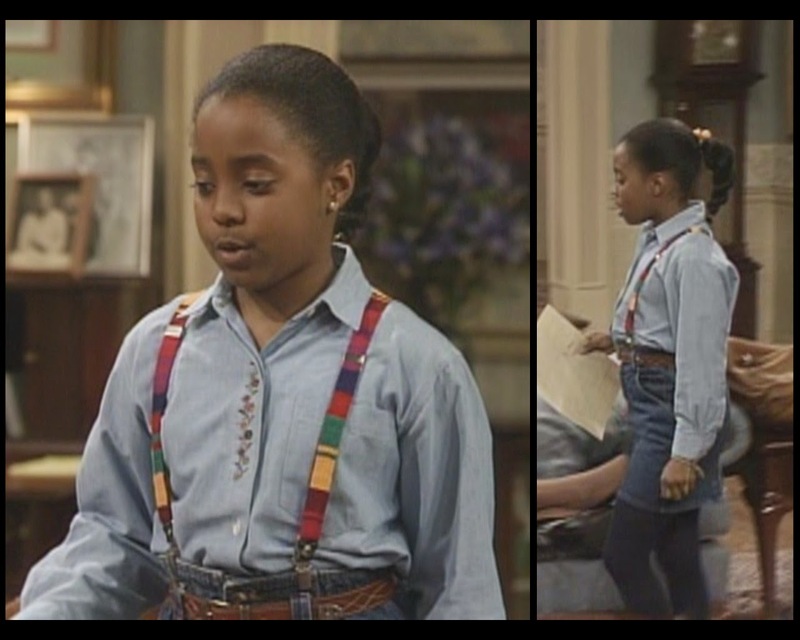 This is a repeat of Cliff's episode #6.3 outfit, albeit with mildly different suspenders. 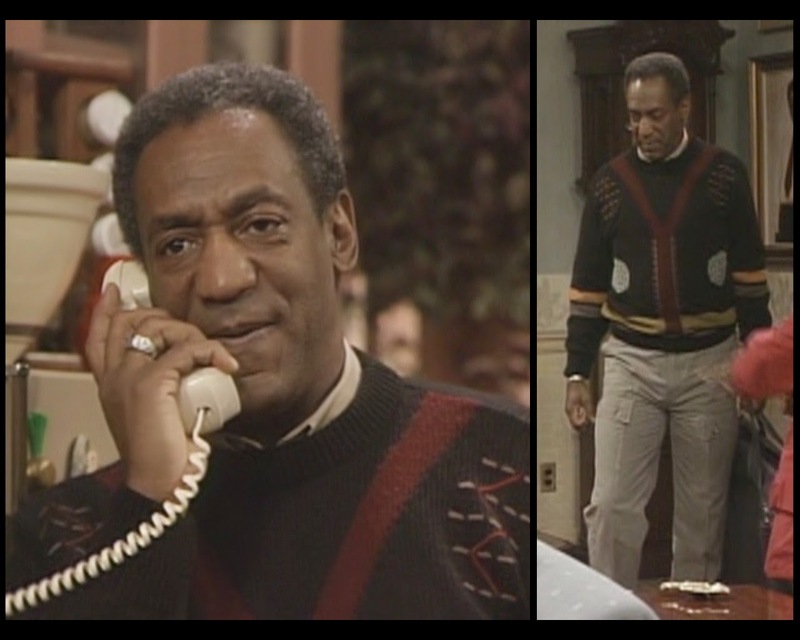 In another of his sweater illusions, Cliff presents as though he's wearing a cardigan when in fact he is wearing a full sweater with a cardigan printed onto it. Tricky tricky. We're creeping ever closer to the next season! I'm going to have to order those DVDs soon. I might put up the donation link again so that y'all can cover that investment for me. i love the FIT joke. I went to a college where many students actually did often wear all the college logo sweatshirts and tshirts, which was unfortunate. 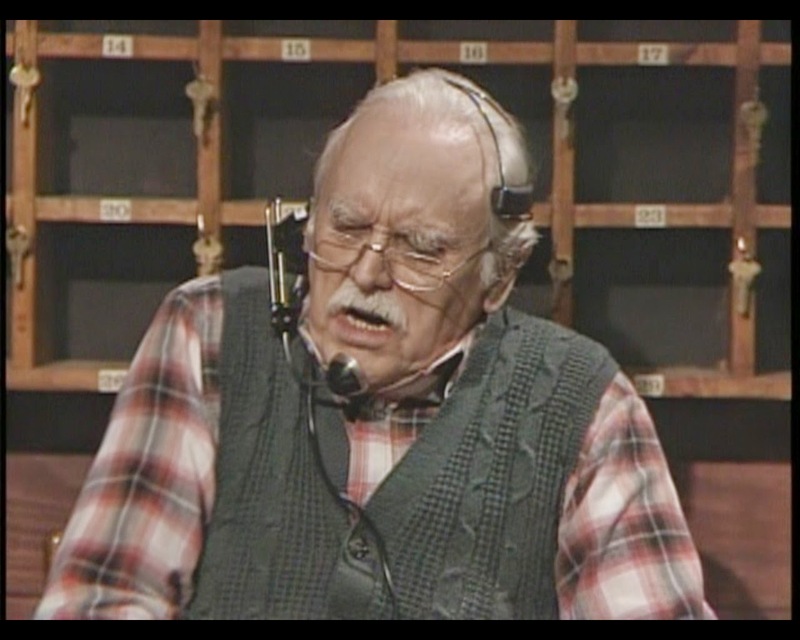 Edmund Lyndeck -- also the original Judge Turpin in Sweeney Todd!